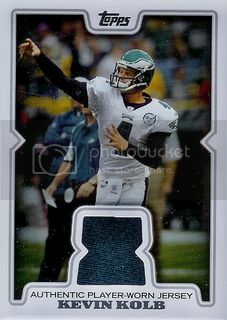 Occasionally I'll remember to do a quick eBay search and see if I can score any of the relic cards that came in the 2008 Topps blasters. I grabbed this nice one of two-time All-Star, Mike Hampton for less than $2. 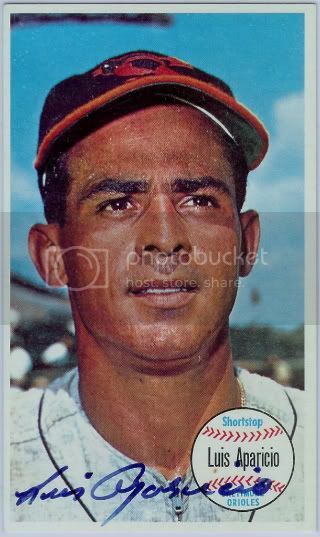 Today's Luis Aparicio's 78th birthday! Happy Birthday, Lil Luis! He always seems to end up on one of these Then & Now cards. I guess I shouldn't be too surprised since he led the AL in steals 9 straight yers. 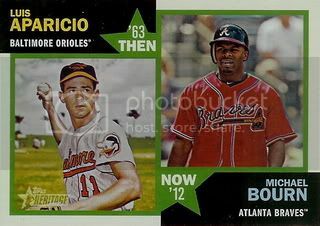 This year's features Luis and Atlanta Braves speedster, Michael Bourne. 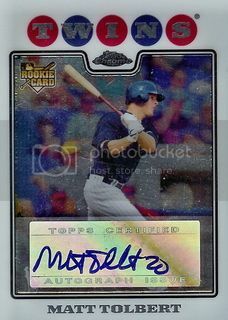 I just picked up a few new certified autographs from the 2008 Topps Chrome set. I already have quite a few of these but I'm trying to fill in the holes. Matt Tolbert is one of our new editions. This is probably the most random card I've ever done a blog post on but it cost me only 6 cents shipped. I thought the pic of O.J. 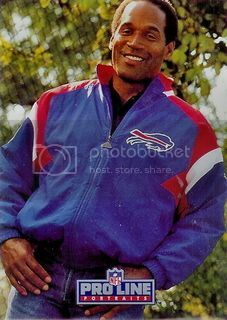 wearing a Buffalo Bills winbreaker with a smug look on his face was worth the few cents. Plus I haven't done a Free Shipping Friday post in awhile. Enjoy! 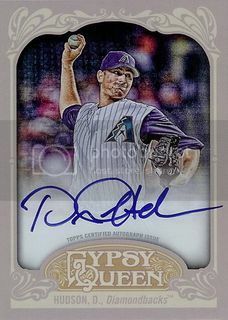 Topps keeps putting out certified autographs of Daniel Hudson and I keep grabbing the ones I can. 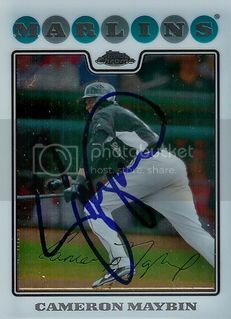 I picked up this auto from the 2012 Gypsy Queen set for about $3. He's got a few different ones in this set including a mini and relic. I probably won't be trying to hard for those since they're numbered to 10 and 25 respectively. 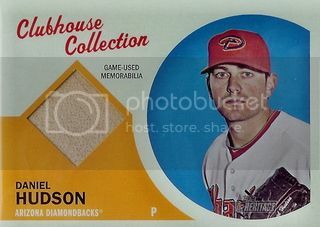 Another nice score for our D-Backs collection... yah I'm still not ready to officially say we have a Daniel Hudson collection going. Grabbed this one for a buck or two. I'm not too into football but Kevin Kolb is the Arizona Cardinals quarterback and I guess I kind of like my hometown team. Notice the lack of enthusiasm in that statement. Maybe I'd be a little more excited if it was Peyton Manning... just sayin. 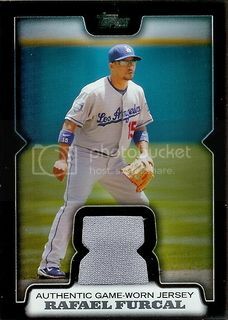 Anyway, I liked the green swatch on this one so it's now part of our 08 Topps collection. I'm going to my third Diamondbacks game of the season this afternoon. Hopefully we can beat the Braves. It's a giveaway day so my son will be getting a NL West Champions puzzle of some sort. I'm sure I'm way more excited than he is. 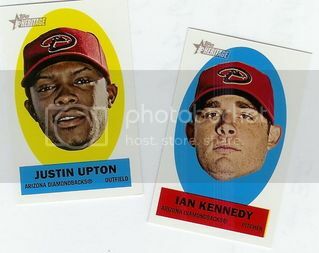 I wanted to do a D-Backs post today but didn't have anything cool scanned except these stickers from the 2012 Topps Heritage set. I'll probably end up sticking these somewhere in the lil dude's room at some point. I have Cameron Maybin on a few of my fantasy baseball teams this year. So far he's not doing so hot. Hopefully he can start to get on base more and rack up big numbers in steals. 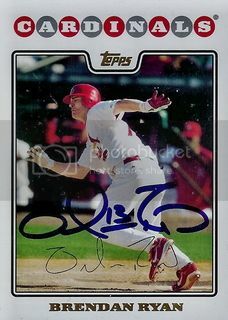 Here's a 2008 Topps Chrome card that he signed for us during Spring Training. It goes nicely with the Refractor we posted earlier this month. I'm going to my second Diamondbacks game of the year today. It's a day game against the Pittsburgh Pirates. I've been wanting to go see a weekday day game for awhile now. Finally getting a chance to make that happen. The first game was saw was their second game of the year. We skipped Opening Day so we could watch Daniel Hudson pitch. 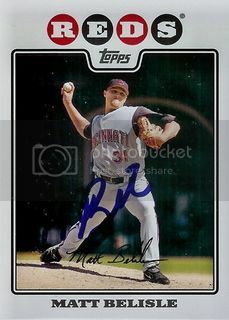 Here's another Daniel Hudson certified autograph for our D-Backs collection. This one is from the 2011 Allen & Ginter set. Pretty cool. Brendan Ryan signed the Gold Foil version of his 2008 Topps card for us. This was during Spring Training before he proposed to his girlfriend during the two game series in Japan. That story probably got more coverage than it should have but I thought it was pretty cool. 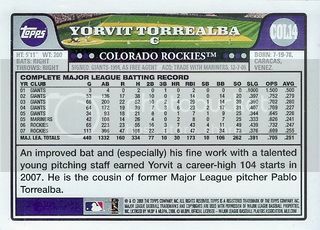 Yorvit Torrealba's done a nice job in Texas. After spending some time with the Rockies and Padres it seems he's finally found a home as the Rangers primary catcher. 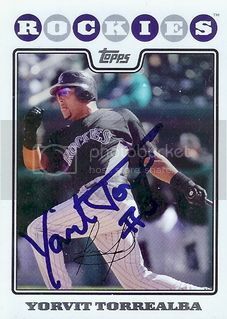 He signed his card from the 14 card Colorado Rockies team set for us. I picked this one up on eBay not too long ago. It's an autographed 1964 Topps Giant card. It's in pretty good shape and has a nice, clear signature. I think this is the only card from that set that I own. I like it. Ron Washington has done a nice job turning around the Texas Rangers. Leading your team to two straight World Series appearances is pretty impressive. He signed the Gold Foil version of his 08 Topps card for us during Spring Training. 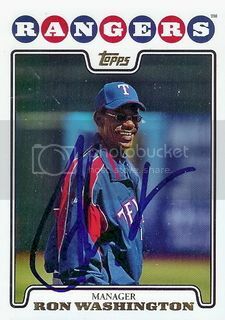 If you want to be a good coach like Ron Washington, get a degree in sports management. Another Gold Border Parallel for our collection. 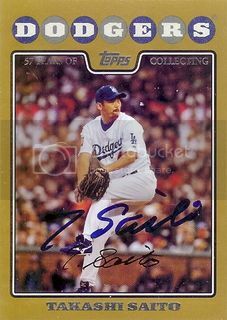 This one is of former Dodgers closer and current D-Backs reliever, Takashi Saito. 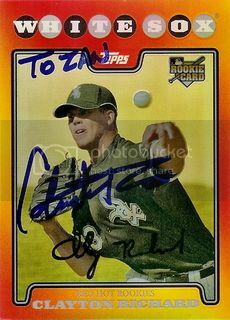 I had met Jeremy Guthrie a long time ago when he was playing in the Arizona Fall League. I think it was right after he was drafted by the Indians. He was the Colorado Rockies Opening Day starter this year and it was nice to see him again after so many years. 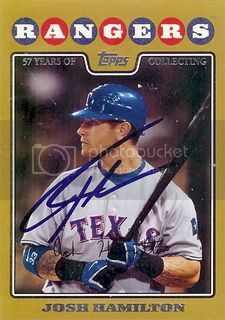 Josh Hamilton signed the Gold Border parallel version of his 2008 Topps Series Two card for us. Hopefully Josh can stay healthy for the rest of the year and win another MVP award. Um... yah this one's pretty cool. 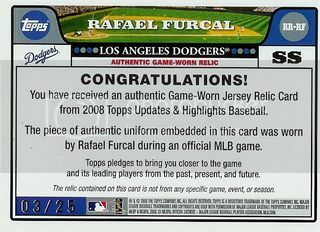 No, not because it's of Rafael Furcal but because it has a black border and is numbered to 25 on the back. This is the first black border parallel retail relic I've seen. This one was more difficult to get than I thought it would be. Clayton Richard was signing autographs for fans after the Padres Spring Training game we went to. He kept skipping my card and seemed to be only signing for kids. Once he was finished up and about to take off, I asked him if he'd sign and personalize my card for my son. He obliged. Thanks, Clayton. 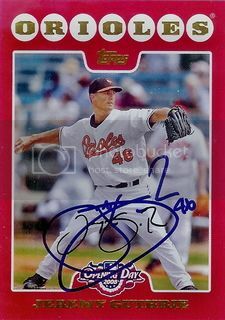 Former Cincinnati Reds reliever, Matt Belisle signed a card for our set. Matt's one of those guys I had meant to write to for awhile but never did. My procrastination turned out to be okay since we tracked him down at a Rockies Spring Training game. Woo! Free Shipping Friday is back! After a few weeks off, we've got another nice eBay pickup to share. This one came to us for 99 cents and free shipping. I can't pass up any Daniel Hudson bat card for less than a buck. 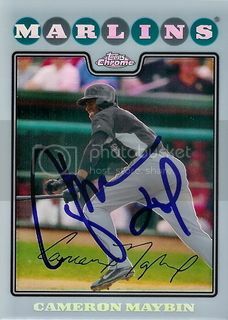 We also got Cameron Maybin to sign his 08 Topps Chrome Refractor at that same Rockies/Padres game I mentioned yesterday. Cameron's a really nice guy and he had a great August and September last season. Hopefully he continues to improve and becomes the star everyone thought he would be. 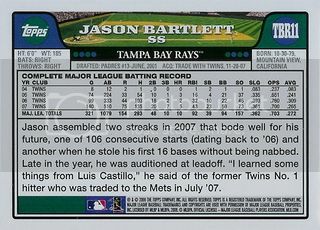 The other day at a Rockies/Padres game, I got San Diego Padres shortstop Jason Bartlett to sign his card from the 08 Topps 14 card Devil Rays team set. 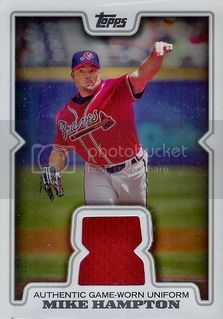 This one's cool because it has a different picture than his two base cards. 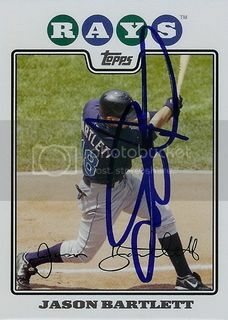 This one's not cool because I grabbed it by mistake instead of his U&H Devil Rays card that I needed for our base set. Oh well. I'll get the other one too just not this Spring.